Path of Greatest Resilience - The Americans .US! Facing an enemy intent on creating a highly contested electromagnetic environment, S&T investments in Army networks focus on mobility, redundancy, ease of use and detection avoidance. The expeditionary nature of the future force will require mobile, secure communication networks that are dynamic—able to survive in active electronic warfare environments and available in all environments to ensure continuous mission command. However, obtaining and sustaining the higher ground in a network context will not come easily in the future battlespace. The enemy will have advanced technologies designed specifically to create a highly contested electromagnetic (EM) environment, disrupting our ability to communicate, degrading our performance and injecting uncertainty into our decision cycle. To address these challenges and provide robust EM defense of information exchange, we need to develop mobile communication networks that can make optimal use of the EM spectrum, enhance EM security and reduce the probability of detection or intercept. In addition, the network must be resilient to attacks in both the cyber and land domains by responding and adapting much more rapidly than today’s networks. It must have low EM signatures and operate on-the-move. The entire network setup, from spectrum allocation to subnet configuration and security monitoring, must be automated to simplify network operation. Today’s tactical Army networks are reliant on conventional radio-frequency (RF) technologies, which limits our ability to maintain communications in a contested environment. Therefore, Army science and technology (S&T) is investing in innovative mobile communication platforms that employ advances in RF and nontraditional portions of the EM spectrum; highly directed adaptive anti-jam antennas to mitigate effects of multipath interference; and new algorithms and software to predict network performance, enhance cybersecurity and provide network self-configuring and self-healing capabilities. Maintaining persistent connectivity, or network resilience, amid the noncontiguous and disrupted communication links in a tactical environment will require an automated intelligence system. Automation and intelligent network switching capabilities will simplify Soldier operation and guarantee the ability to quickly adjust based upon the mission needs and the enemy’s action, in order to establish, adapt and maintain communication in a complex, contested environment. To accomplish this network resilience and agility, Army S&T is looking to the use of multiple redundant network links, a diverse selection of alternate networks, and efforts to decrease the likelihood of disruption by an enemy. Network diversity will require separate physical connections to the tactical internet, the “final-furlong” squad area networks and long-haul networks. Effective network and spectrum diversity allows Army units to communicate regardless of what happens to the physical infrastructure over which those communications are transmitted. Commercial technology has implemented automated processes in mobile devices (smartphones, tablets, etc.) to autonomously transition media among differing network connections without user selection or decision-making about which network to use. For example, automated network selection occurs when someone walks inside their home with a cellular device; that phone is programmed to autonomously switch to a home Wi-Fi network that has higher throughput and better signal strength; the device also uses Bluetooth to automatically discover a smart high-definition TV to telecast video or a speaker system to stream audio. In this commercial implementation, the source and destination devices are linked over a network infrastructure with redundant, highly reliable communication links. The same cannot be said for current tactical Army networks where users may be located in physically and logically separated subnetworks and where the reliability of communication links can be intermittent, especially in contested spectrum environments. Army units need the flexibility to discover and leverage all viable network options, allowing multiple pathways to critical networks and data sources. For ease of interaction with the network, an automated network selection system must maintain awareness of all available network connections, the status of each link and the source and destination of data to traverse the network. This system automates the planning methodology practiced by units to designate the primary, alternate, contingency and emergency (PACE) means of communication used to build a mission-based communication plan. In tactical Army networks, different communication solutions are available to provide connectivity between users across varied environments. These solutions vary widely by technology, protocol, throughput and other factors that must be evaluated for priority in a PACE plan. Most Soldiers are not specialists in establishing or maintaining the network. We must reduce the need for a Soldier to be an expert for every configuration interface of every network radio. An automated PACE system will ease Soldier interaction with data traversing the network without concern for how the data flows from source to destination. The automated network selection system can automatically, intelligently and seamlessly route data over the available network connections as the PACE plan executes. Another major element of network resilience is the need to decrease the probability of detection, as well as jamming and other types of interference. Future systems will minimize, or at least control, the spectrum signature a unit produces during normal operations, in order to defeat detection and eventual disruption. The automated PACE system is also a means to mitigate spectrum interference. When an enemy is successful with interference, the automated PACE system can maintain user-to-user connectivity during primary link disruption, and allow continued communications for units to accomplish mission objectives. Development of solutions for use at-the-halt or near the tactical edge will include technologies from unconventional regions of the spectrum that are difficult to detect or jam, such as terahertz and ultraviolet radiation. An increased understanding of the spectrum environment amid interference and congestion will enhance situational understanding by helping to pinpoint sources of interference and their targets, and this will enable persistent network connectivity. To achieve spectrum awareness, we will leverage every receiver on the battlefield as a spectrum sensor to yield relevant data for signals intelligence, electronic warfare and radio frequency communications. Often, the same dataset can be used to support related mission needs, such as those of electronic warfare or offensive cyber operations. The spectrum data not only feeds the network automation, but is also consumed by purpose-built systems that will effectively visualize this data and provide wide-scale situational understanding. 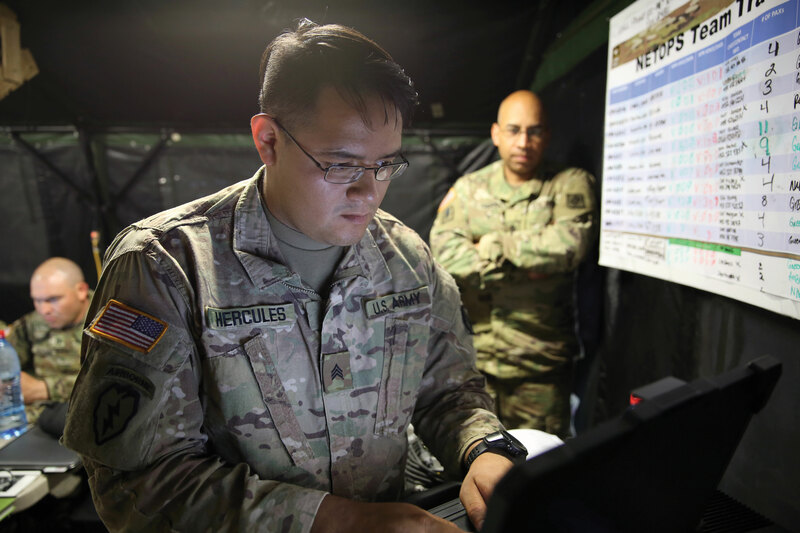 In addition, the Army will need to protect the network from adversaries attempting to geolocate our EM emissions and target them with long-range fires, making it critical to identify capabilities that lower the probability of detection and interception to increase network survivability. Future systems will minimize, or at least control, a unit’s spectrum signature in order to defeat detection and eventual disruption. Successful operations will require the ability to use nontraditional portions of the EM spectrum and to make it harder for the adversary to deny spectrum use to the force. Army S&T is developing technologies to operate in multiple bands from low VHF to millimeter wave band and optical band. 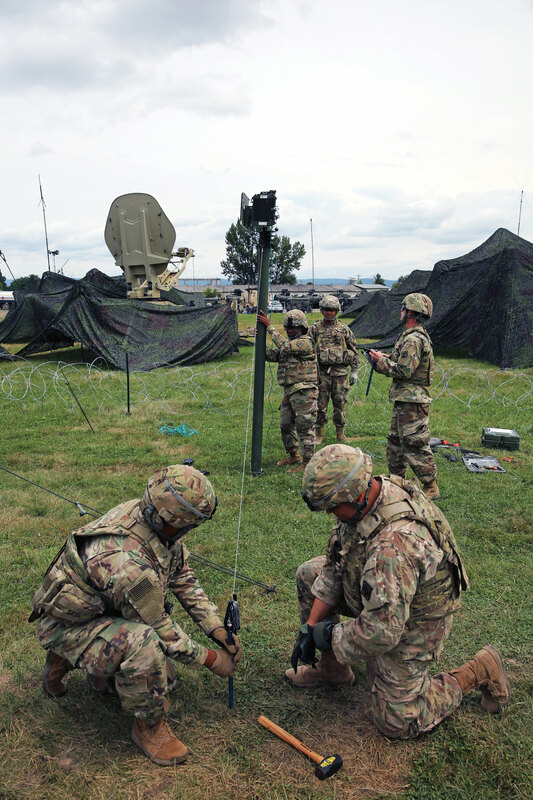 Each of these bands has different performance constraints and capabilities, but together they will enable a hybrid network that can adapt autonomously to electronic warfare attacks, connectivity problems or congestion, thereby increasing the resilience of Army networks. Key to this is spectrum awareness. To achieve this, we are developing approaches to leverage every receiver on the battlefield as a spectrum sensor to yield relevant data for signals intelligence, electronic warfare and RF communications. Longer-term, we are developing technologies to enable combined RF and cyber effects that increase the uncertainty of friendly forces’ locations in both the physical (RF) and cyber environments, as well as the use of quantum encryption methods to enhance network security. The future Army network will possess intelligent automation, network resilience and situational understanding to enable automatic execution of PACE plans. The network will provide fast and reliable communications in anti-access and area denial environments. Simultaneously, flexible and tunable communication platforms will be less susceptible to detection and jamming. Built-in network resilience is a foundational element of network EM security and reliability of operations. Implementation of components that enable spectrum diversity with failover -capabilities—the ability to switch to backup systems after the initial system fails—will achieve more resilient network performance. By coupling varied mission needs with available spectrum data, limiting the need for Soldiers to interact with configuration interfaces and automating PACE transition across a diverse network, we can enable units to meet multiple mission aspects with optimal bandwidth use, fast reconfiguration time and effective self-healing. For more information, go to www.cerdec.army.mil or www.arl.army.mil. SETH SPOENLEIN is associate director for technology, planning and outreach (TPO) in the Space and Terrestrial Communications Directorate at the U.S. Army Communications-Electronics Research, Development and Engineering Center (CERDEC), Aberdeen Proving Ground, Maryland. He holds a Master of Engineering in systems engineering from Stevens Institute of Technology and a B.S. in computer engineering from Lehigh University, and is Level III certified in engineering. JAMES SNODGRASS is an S&T portfolio manager assigned to CERDEC’s Space and Terrestrial Communications Directorate. He has nearly 20 years of Army acquisition experience, primarily with planning and integration of complex information systems. He holds a B.S. in business administration from Thomas Edison State University. He is Level III certified in program management and in information technology and is a member of the Army Acquisition Corps (AAC). MICHAEL BRECKENRIDGE is the deputy associate director for TPO. He has 10 years of Army S&T acquisition experience in network technology. He holds an M.S. in electrical engineering and a B.S in electrical engineering from Villanova University and is a member of the AAC. BRIAN RIVERA is chief of the Network Sciences Division within the Computational and Information Sciences Directorate at the U.S. Army Research Laboratory, Adelphi, Maryland. He holds a Ph.D., an M.S. and a B.S. in electrical engineering, all from the Georgia Institute of Technology, and a Master of Strategic Studies from the U.S. Army War College. He has more than 25 years of experience in networking, network science and cybersecurity. From Minds Think II. Markets I.